Bellingham, Washington – Smart Box Design today is proud to announce that their highly entertaining and chart-topping Farkle game app series has been downloaded over 1 million times. This milestone makes the Farkle series one of the most popular dice games available for iPhones and iPads and Android phones and tablets. The Farkle series offers players an opportunity to challenge friends directly or compete worldwide on leaderboards. The series consists of Farkle Dice, a two or more player game, Farkle Solo, a single player version designed for players who love leaderboards, and Farkle Diced Halloween, a spooky version of Farkle Dice. Farkle is an enormously popular game throughout the world. Players roll a set of six dice for points and can continue rolling the dice as long as their roll yield points. Any non-scoring roll is called a Farkle and the player forfeits their turn and any points accumulated during that turn. Like most games of chance and skill, Farkle’s attraction stems from players hoping to beat the odds and roll a high scoring combination. 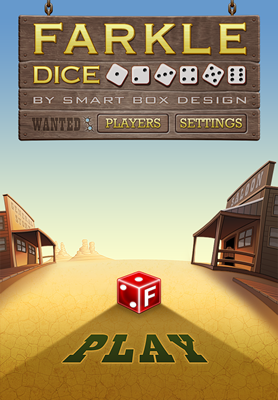 Smart Box Design is known for the attention it places on both the playability and design of its games, and the Farkle series is no exception. There are very few dice games available for Apple iOS and Android with the quality and attention to detail that went into creating the Farkle series. It is beautifully designed with rich hues and entertaining music and sound effects. Each game in the series has an average 4.5 star rating in both the iTunes and Google Market. Farkle Dice, Farkle Solo, and Farkle Diced Hallowing are available for free. An ad-free option is being added to each game in 2012, starting with Farkle Solo. Smart Box Design, based in Bellingham, Washington, was formed in 2003 by game industry veterans who share a common vision of creating exciting, high-quality, strategy and thinking games for mobile devices. Smart Box Design consults on mobile app development and creates apps for third parties in addition to producing their own games. Copyright (C) 2003-2012 Smart Box Design LLC. All Rights Reserved. Apple, the Apple logo, iPhone, iPod and iPad are registered trademarks of Apple Inc. in the U.S. and/or other countries.